June has rolled around so quickly, I can't even believe it. Here's hoping it's another great reading month! In both April and May I read 10 books each month, and I've been pretty pleased with that outcome, especially considering I've had school. 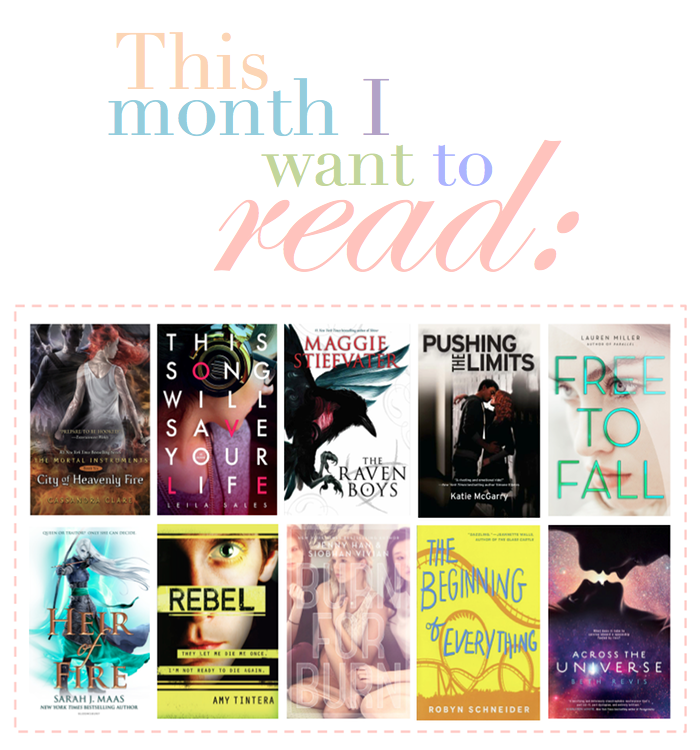 This month I'm aiming to read ten books again! (which is a little bit ambitious because I'm almost in the middle of exams and assessments) I'm going to try my best! I know this is a little bit ambitious for me, but hopefully I can knock down at least five books! Fingers crossed! Have you read any of these books? Did you enjoy them? What will you be reading this month? I'd love to know! I've read a few of these titles, with mixed results :) My June TBR list is pretty small, due to my kids being out of school for summer vacation-I'm hoping to get through 6- 7 books this month. I'm really hoping that these all turn out well! And I think I'll be lucky to get anywhere near 6 or 7 books this month. School is insanely hectic at the moment! I have my vacation right at the end of the month, and I cannot wait!